Intelligently detects and deters true threats. 1080p video with HD zoom. A 140 degree view, day or night. Tell unwanted visitors to move on. Define the areas you want to protect. Enables smoother video with less buffering. High resolution photos saved to your mobile device. Intelligent video for proactive protection. 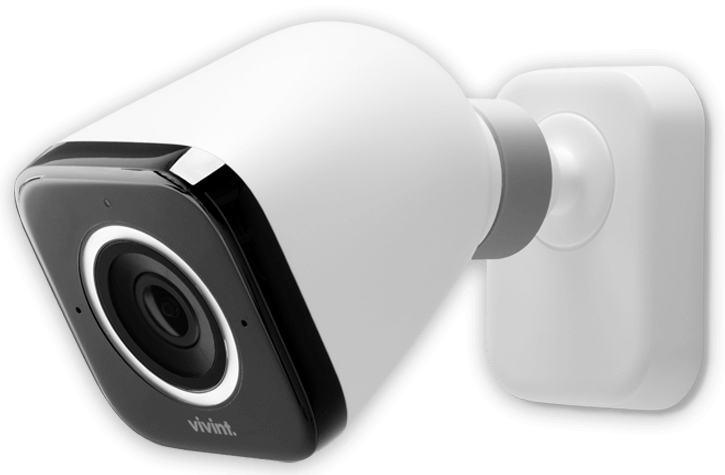 The Vivint Outdoor Camera Pro: Think of it as your own personal security guard patrolling your home 24/7. It’s the only surveillance camera with Smart Sentry™, which intelligently identifies and automatically deters true threats. It doesn’t just record crime—it helps prevent it. Get the full HD view. See what’s happening outside your home from anywhere, day or night. With a 4k HDR sensor, you can get live and recorded video in 1080p resolution. 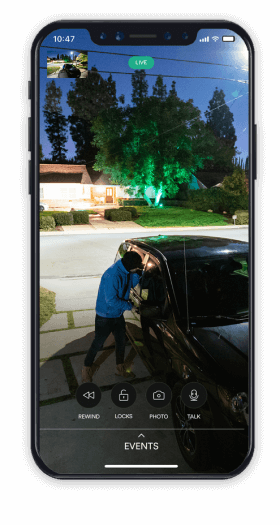 Your screen even maintains an HD image as you zoom in so you can get a clear view of faces, license plates, and other critical details—all from your phone. Smart Sentry™ keeps an eye on the “surveillance zone” you define, paying special attention to people who approach your home. For those that linger too long, Smart Sentry™ illuminates the camera’s LED ring and plays a tone letting them know they’ve been spotted. You can even customize notifications to be alerted when anyone approaches or only if someone is loitering. Enjoy a safer home with cameras and security that work together. As part of your Vivint system, the Outdoor Camera Pro can automatically record when a door or window is opened or even sound an outdoor alarm to ward off unwanted visitors. Two-way talk lets you tell the kids it's time to come inside or tell a lurker that it's time to move on. You don’t want your camera to miss a thing. So we designed the Outdoor Camera Pro to get it all. 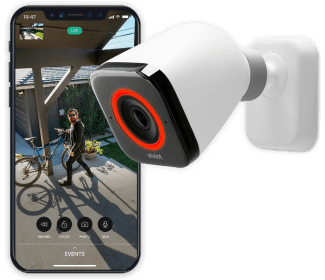 With its wide 140° field of view the Pro captures as much of your yard as possible and records when it detects someone on your property—from beginning to end. And since anything can happen at any time, high-powered IR night vision sensors make sure the camera catches all the action, day and night. Did you know that wireless cameras lose as much as 50% of their signal just trying to get inside the home? Your camera can't help if it can't stay connected. That’s why the Outdoor Camera Pro uses a Hybrid Wired Wi-Fi connection to make sure you have a smoother, faster video experience with less delay and buffering. Smart Home Pros will sync your WiFi, outdoor camera, and Vivint Smart Home products into one complete system to provide you with an effortless smart home experience. The vision of a surveillance camera. The insight of a smart home.